Orchid Valley is a wedding venue perfect for destination weddings in Faridabad near Delhi. They have a lawn area and also indoor banquets in which all the pre-wedding and wedding functions are celebrated. Their property is a farmhouse with the capacity of more than 1000 people. They give their venue to the enlisted decorators who would provide customized weddings to their clients. In addition, they have both vegetarian and non-vegetarian cuisines to offer in their wedding venue space. 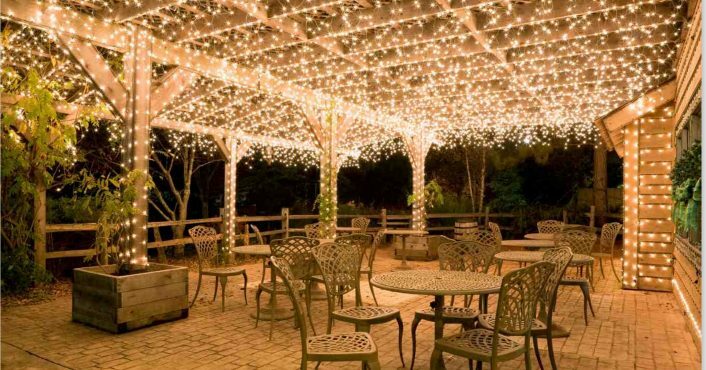 Orchid Valley have outdoor banquet facilities for their clients for all the pre-wedding and wedding day functions. The outdoor banquet has a capacity of 500 seating and 1200 floating capacity. They also have an indoor banquet which caters to their clients and has a seating capacity of 500 pax and floating capacity of 1500 pax. The Radiance Motel located in South Delhi, can cater a gathering for up to 500 people. 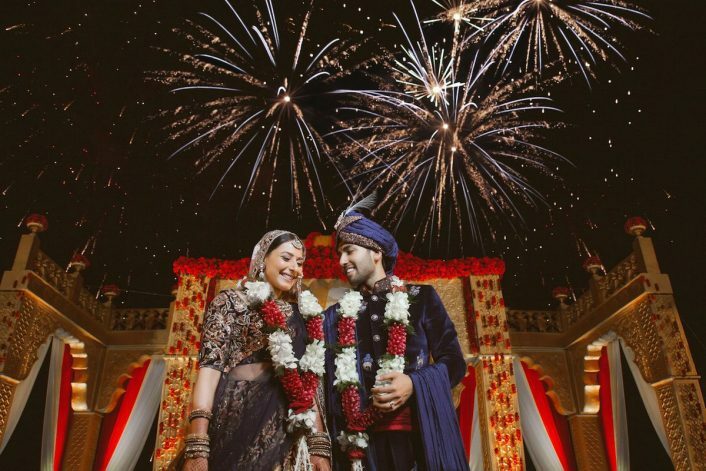 It is a spacious venue with amazing interiors and stunning aesthetics, which also makes it the perfect venue for celebrating all your wedding ceremonies. The exquisitely lit banquet halls and vast lawns give you both indoor and outdoor venue options. There is parking available as well as other facilities like an in-house DJ and decor options. Nestled in the neighborhood of the famous Chattarpur Temple, The Ocean Pearl Retreat is a luxurious farmhouse with a great banquet space. The venue facilitates two lavish and airy lawns for anyone who wishes to host outdoor events. The inbuilt décor reflects elegance and has a soothing and refined ambience. It presents you with a luxurious and convenient facility to celebrate your occasion. It also offers to choose from six multipurpose and modern banqueting indoor spaces that would suffice for various ceremonies and functions for your wedding. If a vast open ground, experienced in-house decorators, ample parking space and great customer service is something that you desire, take a look at the sprawling lawn at Aggarwal Farm in Chattarpur. The venue not only provides every service you might require to plan your events, but also assists you in every way throughout the entire process to ensure that you have a hassle-free experience. Amaara Farms in Chattarpur, is a beautiful and convenient venue for hosting weddings. The sprawling lush green lawn is ideal for an open-air wedding, reception party or any outdoor events. They offer you the liberty to get a caterer and a décor team of your choice to elevate the look of the venue. They have leading professionals in catering, décor and entertainment, as well as experts who will assist you to make your wedding a memorable affair. It provides just the right kind of ambience for any ceremony that you might be planning to host. Solitaire Garden located opposite Qutab Golf Course is the perfect destination for a simple and classy wedding. With modern amenities and facilities, it is sure to make any wedding worth remembering. They have pretty open policies, allowing you to get a DJ from outside, and even alcohol to have a well-stocked bar. The in-house caterers let your guests enjoy a delectable menu and the decent parking capacity accommodates all the guests with ease. Zorba offers a magical setting which will serve as the perfect venue for your special day. It has a magnificent setup of a lush green farmhouse along a poolside villa. It has a rear party lawn and a poolside lawn with an attentive staff which makes it a great platform for a truly unforgettable affair. 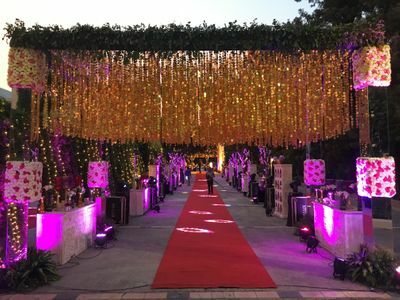 It also offers green rooms and distinguished lounges, valet parking for about 200 cars, dance floor with a DJ- so basically, with great facilities and a breathtaking ambience to have parties, Zorba Entertainment could be called the perfect venue! Fortune Park Boulevard in Chattarpur is the ultimate choice for organising intimate or grand wedding ceremonies. 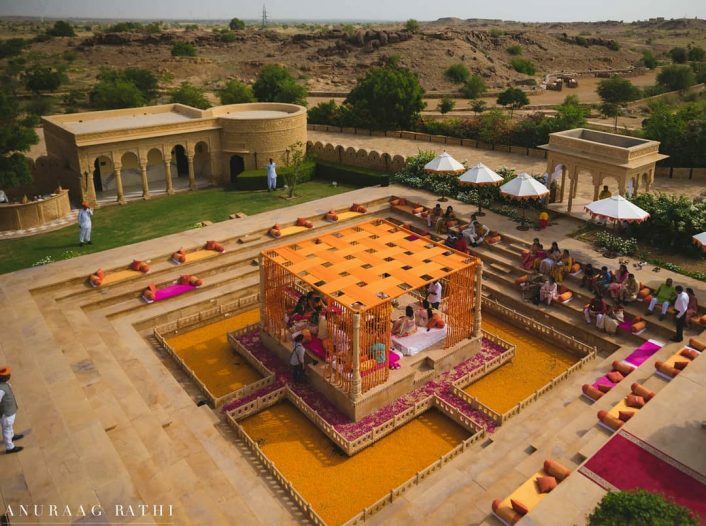 The beautiful wedding venue comprises of two sprawling lawns and a hall. Located close to Orchid Fortune Boulevard Restaurant, the venue has an in-house catering service and décor team. It also offers a complimentary changing room for the bride and groom. Additionally, the venue lets you get a DJ from outside to ensure a foot-tapping time! 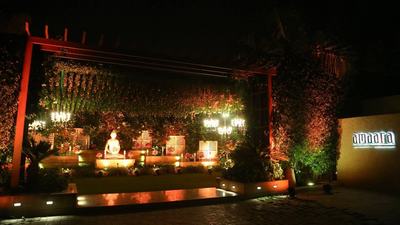 Nandi Greens is a sprawling venue which can host both- an intimate or a grand ceremony! 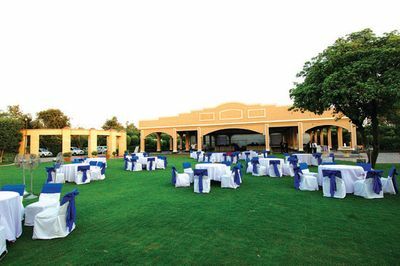 The venue has an advantage of a large seating space and vast lush green lawns that are aesthetic, making it an ideal outdoor wedding location. They have expert advisors who can contribute to make your wedding day perfect. 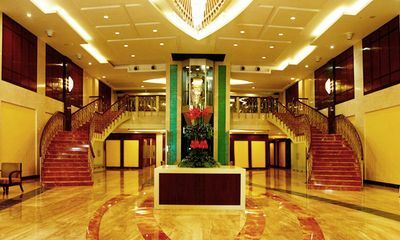 The venue is easily accessible from all parts of the city and is known for its plush and modern decoration and interiors. They provide all the basic facilities like lighting, electricity, and power backup along with additional facilities like valet parking and furniture for the events. If its a lavish celebration you’re planning, then this is one ideal venue for that! Divine Farms located in South Delhi is a spectacular farmhouse for hosting weddings. 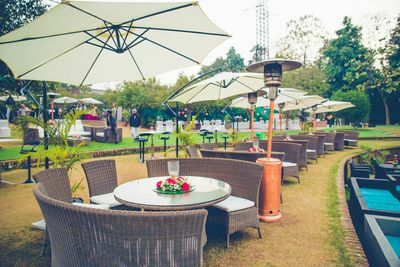 It has quite a large space for indoor and outdoor functions; from formal functions to casual pre-wedding events to a grand reception party, there is no other place more suitable than Divine Farms. For lavish outdoor functions, you can choose the lawn and the poolside which are an excellent choice for fun parties. The venue has in-house catering and decoration facilities, which makes your job much easier. 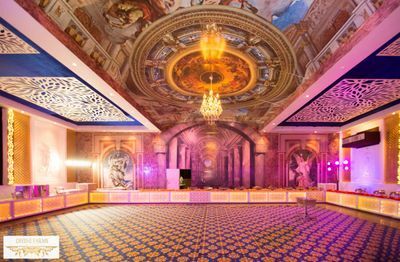 It also has two stunning banquet halls, fancy interiors and a luminous ambience. 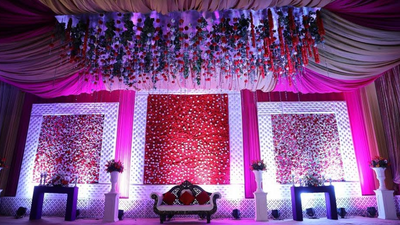 If you are planning a lavish wedding in Delhi and looking for a luxurious farmhouse or banquet hall which is easily accessible to your guests then, Chattarpur is that one prime location. Being located close to South Delhi and accessible through Delhi metro as well, Chattarpur has a number of beautiful and lavish farmhouses and banquet halls available for wedding bookings. 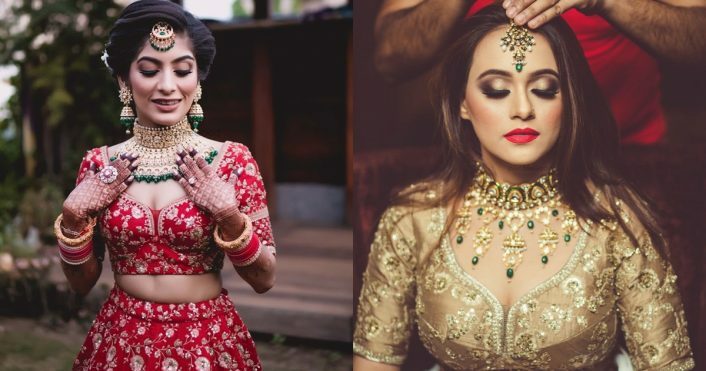 It has some of the best wedding venues in Delhi including spacious farmhouses like Tivoli Gardens, The Ramaya, Sanskriti Greens and beautiful banquets like Radiance Motel, Lata Greens, Shagun farms and much more. 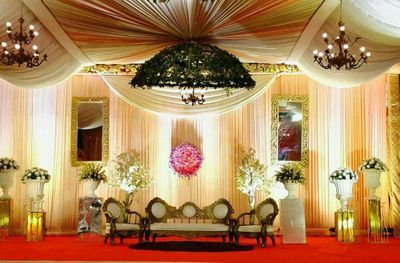 Which is the best wedding venue in Chattarpur? At WedMeGood, we have a list of wedding venues in Chattarpur. You can filter your search by indoor, outdoor, poolside or hotels with terrace. Narrow down your search and select from (x) Lawns/Farmhouses, (x) banquets, (x) wedding hotels, (x) resorts or even heritage properties for bookings. Pictures, real weddings, and reviews will help you choose the best marriage hall as per your budget and preferences. How can I get the best deals on venue bookings? Contact or send an inquiry to the vendor to get the best quote. Ask Wedmegood Venue experts to get you the best deals on your favorite venue. We help you to negotiate for the best prices. Call us or drop a mail on info@wedmegood.com. Donât spend your money and time on these people. They are big bunch of liers. Not at all loyal.